Education: Studied law and oriental literature at Chuo University, and design at Bunka College of Fashion, Tokyo. Career: Designer, Van Jacket, Japan; immigrated to Italy, 1976; designer, Barbas, beginning 1976; designer, Giuliano Fujiwara, Srl, from 1986; women's collection introduced, 1988. Address: Via della Spiga 2, 20121 Milan, Italy. Giuliano Fujiwara, spring/summer 2001 collection. Lobrano, Alexander, "East Meets West in Giuliano Fujiwara," magazine supplement to the Daily News Record (DNR), 29 June 1987. Fressola, Peter, and Alexander Lobrano, "Italian Collections Fall/Winter 1988," in DNR, 20 January 1988. "Italian Collections Spring/Summer 1989," in DNR, 13 July 1988. Lobrano, Alexander, "Milan Sets Stage for 1990s Code," in DNR, 7July 1989. "Giuliano Fujiwaro," online at FirstView, www.firstview.com , 9June 2001. It is paradoxical for Giuliano Fujiwara to be based in Milan, working as a part of the Italian fashion design community. Characteristically Japanese, Fujiwara seems antithetical to everything Italian. He is introverted while Italians are generally extroverted. He under-states while Italians exaggerate. He is reserved while Italians are expressive. Nevertheless, he seems comfortable in Milan where he has lived and worked since 1976, first as a designer for Barbas and then creating his own line of menswear. "If I stayed in Japan," Fujiwara muses, "my work might have followed the direction of Comme des Garçons and Yohji Yamamoto." Presumably he is talking about the Japanese fashion environment, which encourages avantgarde approaches to menswear. The Fujiwara style is a curious mixture of American Ivy League, Japanese stark simplicity, and Italian sensitivity in fabrication and workmanship. Take a typical Fujiwara jacket: it has many similarities to the traditional American style—a straight-cut body, the high button stance, small lapels, the jacket length shorter that the Savile Row prototype. "The Ivy League style was my first love. I loved the way JFK looked," he says, remembering his college days when he organized a group to study the manner of dressing. His first job was with a company called Van Jacket. Although it has long been defunct, Van was a catalyst in propagating the Ivy League look in post-World War II Japan, and its influence is felt even today, as in Fujiwara's case. "Traditional menswear is restricted with numerous rules. My clothes are based on the classic look, but I have eliminated inflexible rules," says Fujiwara. Such a method, however, is not Fujiwara's monopoly. Rather, it is the basic principle for most Milanese designers, with Giorgio Armani being the most notable example. What distinguishes the Fujiwara look from the others is its stoic cleanliness and serene simplicity. To paraphrase, his clothes are disciplined and refined, but lack carnal sexiness. Fujiwara readily agrees; he hates macho images, such as exposed hairy chests and brash exhibition of the male body. 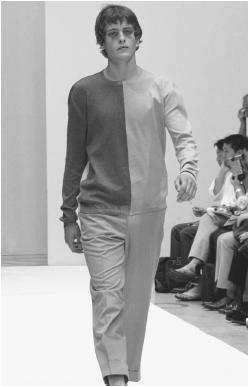 When he shows coarsely knit sweaters or open-neck shirts, his models always wear t-shirts under them. Nor does he like slouchy looks: his trousers are always cut at the top of the shoes, or above. He is quite definite about the choice of colors, too, eschewing dayglo brights or ice cream pastels. These likes and dislikes reflect his concept of masculinity which derives from his nostalgia for old Japan. "I like the image of men from the Meiji and Taisho periods (1862-1926)," says Fujiwara. "They ware slightly rough around the edges and gutsy and robust inside." These men, however, were taught not to show inner feelings and weaknesses, and excessive concern for one's appearance was looked down upon as a sign of shallowness or femininity. "At the same time," Fujiwara continues, "I also like the certain roguish charm of Italian men." Since he launched his own business in 1986, Fujiwara's silhouette has changed little, but his clothes are refreshed each season with innovative details. Intricate inlays and patchwork, oddly placed extra pockets, decorative stitching and pipings, and many other clever ideas are delights for Fujiwara fans who are rather limited in number at this writing. "It takes much longer to build business on your convictions than on trendy fashions. But unless you stick to your guns, I see no reason to be in this business," he says, and he counts stubbornness as one of the essential qualities of a designer. In January 1988, Fujiwara began experimenting with three-and four-button sport and suit coats cut full for the athletic build and military posture, but overplayed styling with hoods, toggles, and bows. For spring/summer 1989, he caught the pacesetter's eye with unusual details for Europe—tweed and pleated center vents on suit coats, precisely tailored cutaway jackets, bell bottoms, and decorative belts, lapels, plackets, and yokes. Long on variation, his focus on boxy short jackets as well as trim and longer styles took the yawn out of menswear. Full-chested topcoats reaching to the knee brought kudos from the out-of-the-ordinary buyer. He made the greatest hit with a three-button suit in straw-toned lined, a red-laced suit lapel, body defining back seams, and jersey motorcycle jackets. Fujiwara's 1990s nostalgia brought back the wide-wale seersucker jackets, but failed to dim his Eurasian charm after twelve years's residency in Italy. His Ivy League sack suits in male monochrome beige, sage, charcoal, and navy stuck to the plain-Jane American lines of the Kennedy years marked by a few quirks, notably, tab-waist short-sleeve shirts and a jacket with lapel zipper. Still looking to the past in 2001, he let black set an ascetic tone and mood in sleek leather and structured basics. For a change, he tied a scarf at the waist of his waterproof Transylvanian cloak. His choice for winter 2002 was a body-conscious layered look with glossy leather gloves and belts to define waistbands.